All of them thru 74 are essentially the same and can be bolted right on your 66 engine. Now the heater box police can start to pick nits. 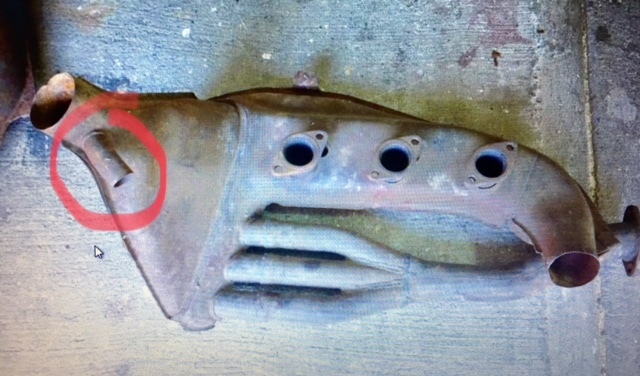 Can anyone tell me what this small tube (circled) is for? I don't have this on my '66. It is for a rubber hose that goes to a MFI pump for heat. Not needed for carbs or CIS. Can be blocked off. The pre-heat tube would of appeared on 69 MY. Does anyone have a photo for a 911T engine? Anyone have a pair of used ones for sale? Thanks for the link mate but I'm trying to source cheaper ones as the postage cost will be a killer...Cheers! Last edited by al agustin; 02-11-2019 at 02:00 PM. My '67 Normal had the original heat exchangers with "chokes" in them. I still have them but SSI's are on the car. FWIW: Porsche experienced cracking issues in some heat exchangers noted in a bulletin dated December 16, 1966. The bulletin is 2 pages and gives a description of the work scope and labor time. "The introduction of such gasses into the passenger compartment may be unpleasant and, under certain circumstances, will present a significant safety risk. Therefore, the program described below must be carried out as quickly as possible"
In another bulletin Porsche also allowed customers to upgrade to the 911-S heat exchangers however they charged for this because performance was increased. The cost was $65 each. Porsche claimed an increase of 10-12 DIN horsepower with the "S" heat exchangers. The heat exchangers in question were: 911.211.011.00 left 911.211.012.01 right. The new heat exchangers were: 901.211.011.01 left 911.211.012.02 right. The "optional" S heat exchanger part numbers were: 901.211.017 left 901.211.018 right. I would strongly advise adding location info so that we can avoid wasted effort. Long distance or cross border shipping is a deal killer.